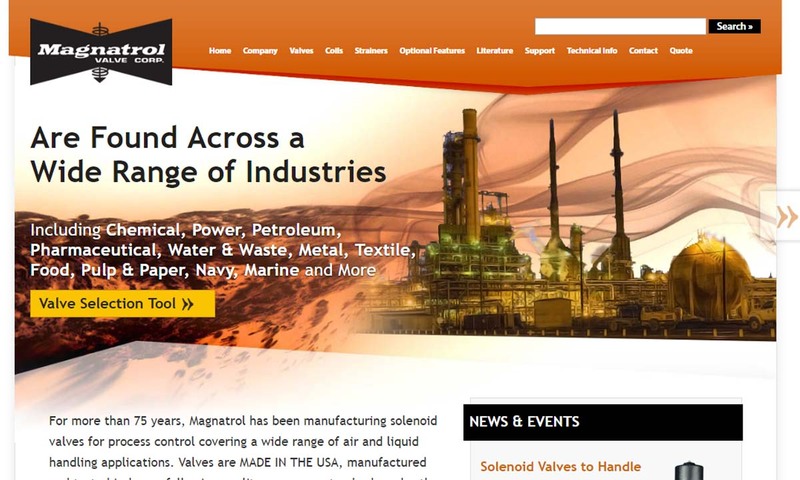 A reliable source for Solenoid Valves information and a resource for accessing leading Solenoid Valves and suppliers. Solenoid valves are electromechanical valves used to control the flow of liquids or gases. Manufacturers produce solenoid valves for those seeking a mechanism that offers services such as: releasing, mixing, shutting off, dosing or distributing fluid or gas. Because of the advantages they offer in the way of safe and rapid switching, reliability, long service life, and compact design, solenoid are very popular in a variety of industries. However, they’re most frequently employed in the residential, appliance, industrial, and commercial industries. Solenoid Valves Solenoid valves are electromechanical valves used to control the flow of liquids or gases. We make the best solenoid valves in the industry! All of our products have been guaranteed for over 46 years and we are keeping it that way. We devote all of our extra attention directly to our customers. Our solenoid valves are all tested in house following very strict quality guidelines. We opened our doors in 1936 and ever since then we have been committed to bringing top of the line products and customer service that cannot be beat! Over 100 years of experience across a wide range of industries has given Humphrey Products Company the expertise and skills required to meet almost any flow control need. 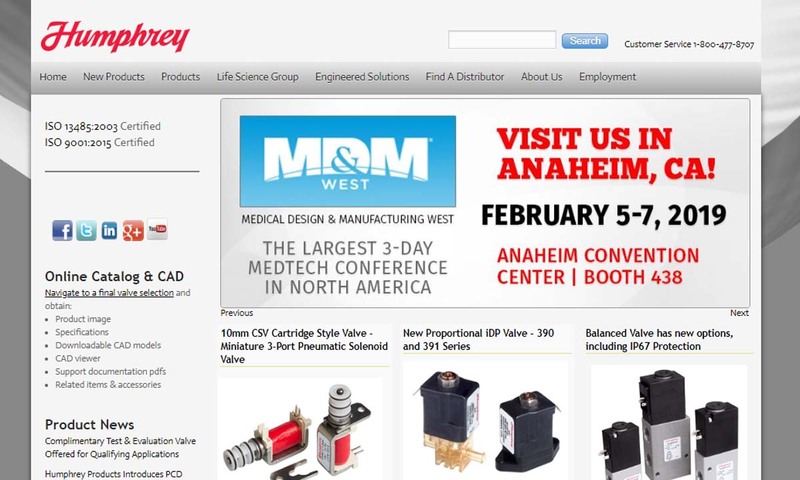 Solenoid Solutions manufacturers custom direct-acting 2 and 3-way solenoid valves and multi-valve manifolds for OEMs in the medical, appliance, transportation, power generation and industrial equipment markets. We are the manufacturers of some of the world’s leading solenoid valves. We strive to provide you with products that will last as long as you need them to. We are dedicated to providing service that exceeds expectation one hundred percent of the time. The first solenoid valve was the solenoid control valve, sold and manufactured in 1910 by ASCO Numatics. Then, in the 1950s, manufacturers began distributing plastic molded solenoid valves. The switch to plastic meant that solenoid valves were now more efficient, reliable, corrosion resistant and chemical resistant. This trend of improvement continued on into the late 20th century. For instance, starting in the ‘70s, manufacturers began producing automatic shut-off solenoid valves, which were safer and easier to operate than manual control shut-off valves. In the 1990s, governments around the world, as well as independent organizations, began creating solenoid valve standardizations, which enabled a higher frequency of international trade, easier collaborations between companies and easier maintenance. Today, newer standards also restrict the use of hazardous substances in valve fabrication, so as to improve their environmental friendliness. Today, much of valve fabrication and use innovation is focused on health and sustainability. Manufacturers produce solenoid valves via a variety of processes, such as: CNC machining, laser welding, injection molding and coil winding. Once they’ve fabricated the valve components, they assemble them. These components include: the solenoid valve coil, the valve, an inlet port, an outlet port, a spring, an orifice and an actuator. Often, solenoid also feature seals. Manufacturers have a wide variety of materials available to them with which to construct their solenoid valves. Valves may be made from both plastic and metal materials, such as PVC, natural polypropylene, PTFE, CPVC, stainless steel, bronze, aluminum, and brass. Seals, like viton seals or nbr seals, are usually made from some sort of rubber. Occasionally, manufacturers will make stainless steel seals. Solenoid valve manufacturers make choices based on application specifications such as: nature fluid/gas inside pipe (corrosiveness, hazardousness, viscosity, acidity, etc. ), environment, frequency with which the pipe will be used and application standard requirements. Based on the specifications, they can choose design aspects like: valve size, valve material, valve type and configuration and number of ports. 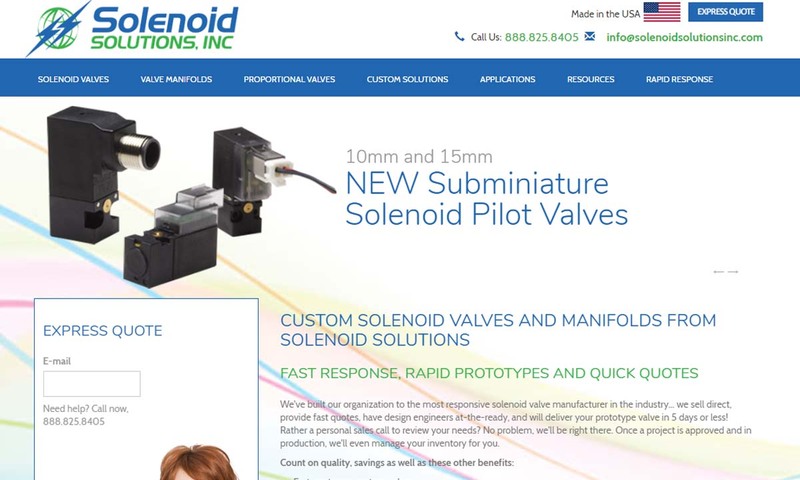 Suppliers may customize your solenoid valve system in a number of ways. For instance, they normally create valves with two connection areas and one orifice, but they can also make you valves with three connection areas and two orifices. Likewise, while they usually design valves to run using a 12-volt DC power source, they can also customize them to work with 3-volt, 6-volt or 24-volt power sources. They may also provide you with specialized: pressure levels, spring return, valve size, etc. Solenoid valves function using two main components: a solenoid coil and a valve. The coil is a magnetized wire coil that comes alive from a series of electrical charges and then emits a current flow. This current flow generates a magnetic field that converts electrical energy into mechanical to move the actuator. The actuator is an extension of the valve; it, along with an attached string, is responsible for moving the valve from an opened to closed position. Solenoid valves are generally built as either normally closed (NC) or normally open (NO) devices. Normally closed valves operate with an inner plunging rod or pin, called a plunger, held in place by the solenoid coil, that blocks current flow. To activate flow in an NC valve, an electromagnetic charge must be sent through the coil, which will then lift the plunger out of the way to allow flow. NO valves, on the other hand, are the opposite. They will close when the solenoid is activated. Solenoid water valves, also called hydraulic solenoid valves, direct water flow with pilot-operated, normally open valves. 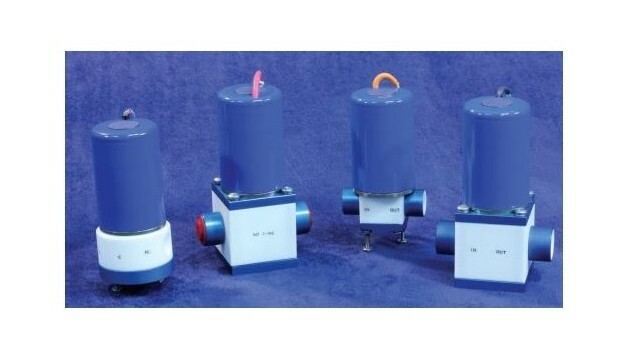 Solenoid air valves, also called gas solenoid valves, air valves or pneumatic solenoid valves, regulate air and gas flow with diaphragms and gas pressure. They are able to maintain both regular pressures, like those maintained for home heating and cooling, and extremely high pressures, like those regulated for power tool operation. Proportional solenoid valves work like regular pneumatic valves, aside from the fact that they operate with more advanced flow control capabilities, which allow them to establish variable flow, proportionate to the valve’s electrical control signal. Solenoid valves are either pilot-operated or direct-acting. A pilot-operated solenoid valve, which is a combination of either a hydraulic valve or a pneumatic valve and a smaller solenoid valve, uses a diaphragm rather than a plunger to create differential pressure and thereby control flow. A direct-acting solenoid valve uses a plunger that has direct contact with the in-flow valve body opening, called an orifice. In this case, the plunger opens and closes the orifice to control flow. A semi-direct operated solenoid valve borrows attributes from both direct act and indirect act valves. This allows them to work from 0 bar (0 psi) while handling a high flow rate. Usually, they are used for high pressure applications. High-pressure solenoid valves are excellent resources for flow control in areas that are incompatible with other valves, like in work areas that engage with dangerous machinery or inaccessible lines. Stainless steel solenoid valves, as their name indicates, have a stainless steel body. Because stainless steel is corrosion and abrasion resistant, stainless steel solenoid valves work well with chemical processing applications, which require outstanding control of bases, acids, and analytical reagents. Miniature solenoid valves are the perfect size for delicate medical equipment like biotechnology equipment, portable medical devices, and gas analyzers. A butterfly valve is a solenoid valve that regulates or isolates fluid flow. Its closing mechanism is a rotating disc positioned in the center a pipe, where a rod passes it through it to an actuator on its exterior. When the actuator rotates, the disc will turn as well, either perpendicular or parallel to the flow. A butterfly valve is always present within a flow. An actuated ball valve is named as such because it contains a ball with a small hole in the middle, which helps it control material flow through a pipe, and an actuator that rotates the ball. When the actuator rolls the ball, the flow either starts or stops. One of the most common types of ball valve is the three-way ball valve, which has three ports. Primarily, actuated ball valves are used to start and stop flow, but not necessarily control it beyond that. Actuated ball valves are best for use with high flow applications and applications requiring the option for manual override. Tubular solenoid valves are simply tube-shaped solenoid valves. They are usually used with DC power applications only. A poppet valve, sometimes called a mushroom valve, consists of an oval or round hole, along with a disc-shaped tapered plug located at the end of a shaft called a valve stem. The poppet valve, which can be closed or open type, is used for controlling engine air/gas flow quantity and timing. It is made from stainless steel or brass. Solenoid valves made from brass are great for use with non-corrosive substances, like inert gas, water or light oil. They are not strong enough to carry highly corrosive substances. Solenoid valves made from PTFE, also recognized by its brand name Teflon®, are a great choice for harsh gases and corrosive fluids. There are many reasons to purchase a solenoid valve over others. With fewer moving parts than other valves, solenoid valves are comparably low-maintenance. 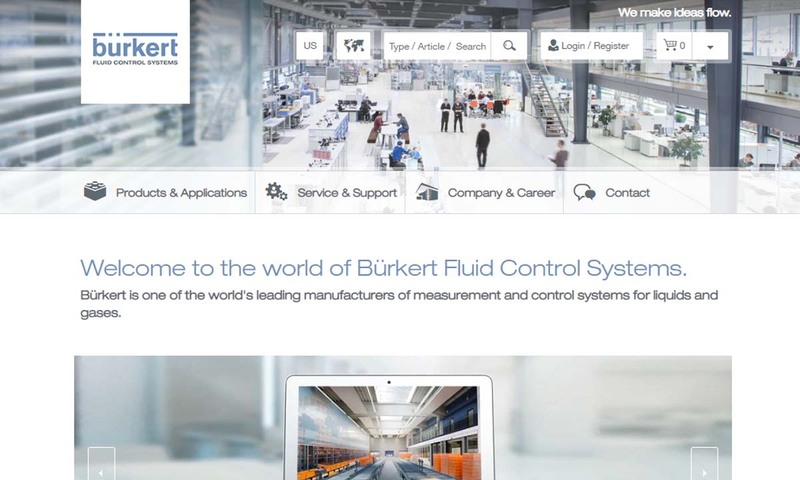 They are also operable by remote devices, which is an invaluable feature for hazardous applications. In addition, they can be made portable. Finally, solenoid valves are flexible; able to use either hydraulic or pneumatic power. Typical solenoid valve accessories include: connectors, manifolds, screws, gaskets and lights. Of these, connectors are most common. They help you put together more complex valve assemblies. To find out what accessories are best for your application, talk to your manufacturer. Install solenoid valves at critical points in order to give any system the ability to work optimally for many years to come. Always make sure to install them in a dry and well-ventilated environment, because they can heat up quite a bit during operation, and you don’t want them to overheat or react with something around them. Keep an eye out for an arrow on the valve body, which indicates flow direction. Install it in that direction. With a little attention, your solenoid valves will last for a long time. One way you can care for your valves is simply by cleaning them regularly on a set schedule. With the proper tools, like those provided in a maintenance kit, you can do so without fully disassembling your valve assembling. In addition to regular cleaning, if and when you notice leaks, excessive noise or sluggish operation, you should clean your valves as soon as possible. To improve valve system performance, avoid using mismatched fluids, as doing so can cause early wear. Also, never allow substances inside your valve to freeze. Likewise, always keep your valve contents at the proper temperature and pressures. The standards to which your solenoid valves will need to adhere depend on your application, industry and location. If your valves will be coming in contact with drinking water, for example, your solenoid valves must be lead-free. In the United States, drinking water and plumbing codes require RO (reverse osmosis) equipment must be NSF certified and/or meet NSF 61-G, a leachate and lead-free regulation put out by NSF (the National Science Foundation). If you’ll be using your solenoid valves abroad, they need to be certified lead-free by NSF International and accredited by both ANSI and the Standards Council of Canada. In addition, NEMA (National Electrical Manufacturers Association) offers standard designations for valve suitability. Generally speaking, the higher the NEMA type number, the harsher the exposure the valve can withstand. For example, NEMA Type 1 valves are well-suited for indoor use, while NEMA Type 7 and 9 valves are best for environments that feature explosive dust or vapors. When searching for solenoid valves for your application, you must make sure the manufacturer with whom you work is able to meet all of your specifications, including certifications, lead times and budget. Sometimes, it’s beneficial to look into quick-shipment programs, rather than standard shipping options. Don’t forget to talk to your prospective supplier about that. In addition, you should consider a manufacturer that offers a good support system.  This means that they will be available for installation assistance, onsite training and availability for consultation, parts maintenance and parts replacement after installation. Finally, it’s extremely important that you work with a manufacturer you can trust. 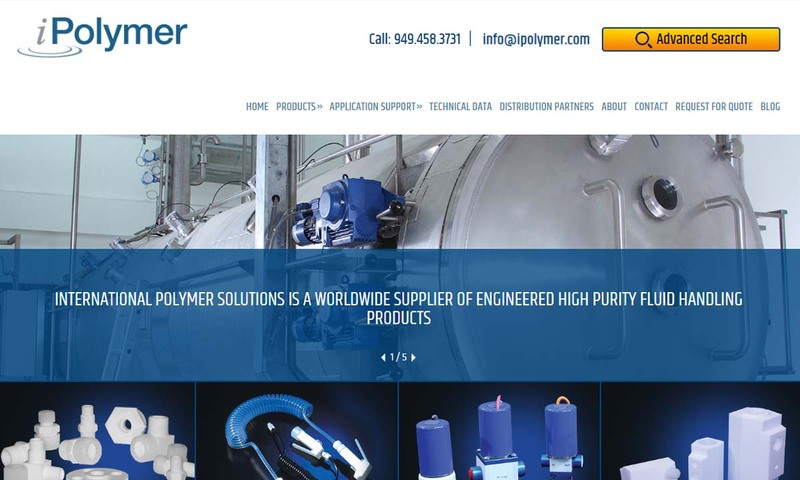 To find an experienced and reliable supplier, check out the comprehensive list we’ve provided on this page.